The Monumental Task Of Reopening Puerto Rico's Schools : NPR Ed Puerto Rico's education secretary, Julia Keleher, says the few schools that are open are providing basic services. But there's still so much work to be done. 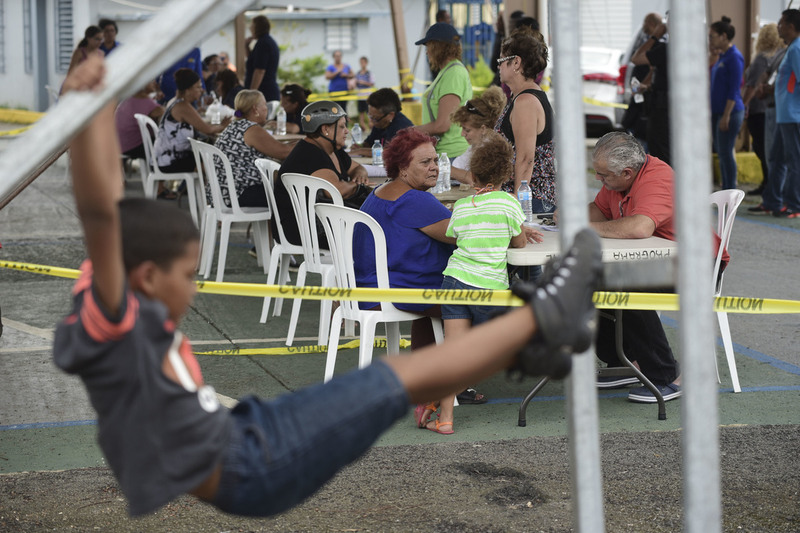 In the aftermath of Hurricane Maria, residents meet with FEMA representatives to file forms for federal aid at the Jose de Diego Elementary School in Las Piedras, Puerto Rico, on Oct. 2. On Wednesday, we reported on two schools that have reopened — one public and one private. And this week we spoke with Keleher by phone about the challenges students and educators are facing. Our interview has been edited for length and clarity. Broadly, can you give us an update on the state of public schools in Puerto Rico? We have 345,000 students and 1,113 schools. Last week, we opened 22. This week we're opening another 145. And then, I've identified 227 that, when we remove the debris, we can open. So we've been making small gains, heading in the right direction, I think, trying to give an opportunity for things to kind of look and feel like they're getting back to normal so kids and families have a place to go. So I think the goal is, we're looking at Oct. 23 as the date to have school come back online. We're going to be making that a regional decision-making process. So before, it was a unitary system and that means that all 1,113 schools follow the same set of rules, but now we're going to have seven regions which would function more like districts. The idea is that part of the problem with this system previously is that it was all centralized. There's too much bureaucracy. So what we're trying to do is push the decision-making back down closer to the level where people are actually working. And was that a decision taken after the hurricane, as a result of the hurricane? Before. And it's interesting that you ask that question, because what we're finding is that the reforms that we wanted to implement are even more relevant now. And we have more of an opportunity to move quicker with their implementation. Are there any areas of the island where you think it's going to take longer to open up? There are places where the storm entered and exited that were just significantly impacted. The move toward regional decision-making helps us better isolate those problems and figure out where they are and develop a localized response to it. San Juan is not representative of the rest of the island. So it is very important that the people who are in those other regions are able to make decisions and ask for resources based on what they're seeing. They have to have that autonomy, they have to have that responsibility, that they have that authority because I can't see from here what it is that they need. What's the biggest obstacle to getting schools back up and running? And what are you doing to deal with the trauma of the hurricane for kids and for teachers? We brought in an [expert] from Miami-Dade and he came here for a week. We had a shared conversation with the Association of Private Schools. We brought in the union leadership, we brought in senators, we brought in thought leaders in the community to make a public and an explicit statement that the department understands the amount of loss that people, that are, you know our family — our extended family — have experienced. Teachers lost their homes and students saw their families lose their homes. So we wanted to give that its deserved space and respect people's experience. Folks reached out and said, "Puerto Rico's going through this, can we help?" So now what we're working on is a way of scaling it. So the important thing is that the message is there, and there will be continued support for it throughout the remaining part of the school year. One idea that [the Miami-Dade expert] mentioned was having an activity as part of a school day where you're doing breathing or you're focusing on wellness or there's yoga or some kind of sort of settling mindfulness experience. And so we're going to move forward with that. I know it's difficult to speak generally, but do you have a sense of how the kids are doing in terms of trauma following the hurricane? The fact that we've opened up 20 schools last week and the 145 this past week — it's been a great experience. The middle school kids were cutting out and making traces of their hands and then putting on there things that they would do to help in their community. And the seniors made like a wishing tree but they had values and sort of made a promise of what they would do to help rebuild. I think it's cathartic in a way. And I think it's a safe space. And I think the school being open even though it's not instructional time, it's not our calendar, we're not back online — it provides a safe space to be able to process. And we can also take lists of names, and an inventory of supplies or resources or clothes — things that people may need and try to figure out how to channel those quicker for them. And are most of the schools that are open providing food and other support? Breakfast and lunch, and we have social workers that are doing visits. See if people need medicine. You know it's functioning as a connection point, where if it's open and it's predictable and it's in the community and we can feed people and try to get a sense of what the needs are in a community, but then also have a way of coordinating that. There were cases where there were no communications, the telecoms went completely down. It was very hard to find out what people needed. So having the school as a sort of hub is proving to be something that's having a positive effect. It's hard to ask for resources if you can't even communicate. Have you been able to make contact with all the schools? We're working through all of the regional directors, which would be the equivalent of a superintendent in the unitary system, and that has helped. So I have data on about 73 percent of [the schools]. The hardest areas to collect information on the status of schools and damages has been Caguas and Humacao, and they were both regions that were more significantly impacted. Do you feel like you're getting enough resources from the government? Our budget, our state budget was reduced 10 percent because of the fiscal crisis. And you know, we've had a reduction in the number of teachers, but I also have a teacher shortage. There's a reduction in the number that I can hire. And there's a reduction in the number of teachers that are here to hire, especially in hard-to-fill areas. Do you anticipate getting any further resources from the federal government? We need an aid package. I've made that request informally. If you look at a situation like Katrina, they got a huge amount of federal relief. And so not only are we looking forward to the federal funds that we'll receive as a result of damage reported to our buildings through FEMA. We're also looking forward to support with federal funds to impact the quality of schools and the number of options that we actually have here. And what are you planning to do to make sure that kids don't fall behind as a result of lost school time? We have a couple of options. It's hard to build consensus when you have 31,000 teachers. [And] we're not paying them well. A lot of them have second jobs and they have things to do after work. And traditionally the day has been 8 [a.m.] to 3 [p.m.]. So, I'm advocating for it being 8 to 5 and they use those two hours at the end to focus more on these wellness activities and project-based learning. It's about 40 instructional days [lost], between 35 and 40. It's about 270 plus instructional hours that we have to put back. We're also going to need to work a couple of weeks in June. Typically, working in the summer months here has been sort of off-limits. But at this school I was out this morning, they were telling me that they didn't want to do the extended day because they had things to do after school and they would prefer to work in the summer. It's interesting, the event has created conditions where I'm able to move faster with the kinds of reforms that I want to, because it's displaced so many things and it's broken the paradigm. And so things that were never on the table are now on the table.